What’s the most disconnected thing a person can do in a physical sense? Besides becoming a hermit, the next best thing is visiting an island. Not a well populated one, mind you, such as Indonesia, Japan or Great Britain. But a secluded one. An unknown one. A distant one like these. Once a Japanese territory until Russia overtook it in the final throes of World War II, Sakhalin is a sparsely populated island perpendicular to the two neighboring superpowers, which shaped it. Although short on tourist amenities, the large island is rich in natural beauty and best discovered with either patient planning or a paid guide. Popular to-dos include diving off Moneron Island, Alpine Skiing near the capital of Yuzhno-Sakhalinsk (population 20,000) and rafting the Bykovsky Rapids. Many years ago, the Navy decided this tranquil tropical island would make the perfect bombing test site. Amid public outcry, that all changed in 2003 after the base was turned over to the U.S. Park Service. Because Vieques is one of the few underdeveloped but still stunning Caribbean islands, tourism has steadily increased ever since. Popular attractions include the brilliant Bioluminescent Bay, kayaking and an indian stonehenge (if you can find it). To keep the best beaches to yourself, rent a small truck or 4X4. Some of you are familiar with these subtropical Portuguese islands. Most of you aren’t and that needs to change. Known for their green pastures, dramatic volcanoes, towering mountains and blue hydrangeas, the nine-island Azores are a popular hiking and seaside retreat. 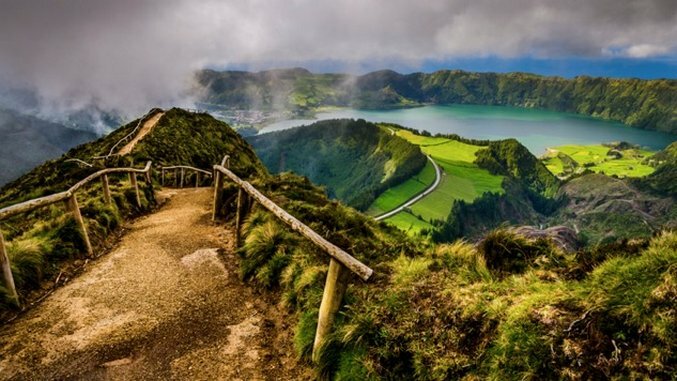 Visitor itineraries usually include the astounding views of Caldeira das Sete Cidades (pictured at top), climbing the Caldeira in Horta, mid-Atlantic whale watching and fishing for marlin. If its beauty (above) don’t convince you that Lord Howe Island is an extraordinary place, let me fill you in. Situated 340 miles east of the mainland as you bear towards New Zealand, only 400 tourists are allowed to visit it at any one time. At seven miles long, you can bike the entire island in less than an hour. There’s world-class reef snorkeling here. Bird-watching. Hand-feeding fish at Ned’s Beach. An “on your honor” unattended nine-hole golf course. And most importantly, no cell-phone reception. Halleluja! In a country known for its iconic beaches—Ipanema or Copacabana anyone?—Fernando De Noronha is known for even better ones, namely Praia do Leão and Baía do Sancho (pictured). Like Lord Howe Island, however, only 400 visitors are permitted on any given day. For the lucky few who make it, there’s crystal blue waters, spectacular snorkeling, trick-performing dolphins and your own private paradise. The only downside? It’s expensive.